Spider veins are also known as telangiectasias. They are caused when the blood vessels near the surface of the skin or mucous membranes get dilated. They look similar to varicose veins, but they are smaller. Varicose veins are twisted and large in size and are red or blue in colour. Spider veins on the other hand are smaller compared to varicose veins, and look like tree branches or like spider webs. Hence they got the name spider veins. The primary cause for the appearance of spider veins is weak or damaged valves in the veins. Weak veins cause blood to leak back to the veins and accumulate. This makes the veins look bigger. As you know, veins are responsible for carrying blood from the body to the heart. The blood from the lower body is pushed back to the heart through the veins, against gravity. As you get older, your veins may become weak and you are more at the risk of developing spider veins. In some family spider veins are seen generation after generation. They run in the family. During puberty, pregnancy and menopause, hormonal changes may take place in the body. This can lead to the appearance of spider veins on your body. When you stay in one position for a long time, your veins will have to work hard to supply blood. When you stand for a long time, it can put pressure on the veins. This can lead to such a condition. Being overweight can also cause spider veins. When you are overweight, your body can put extra pressure on the veins that supply blood to the heart. As a result, you suffer from spider veins. Pregnancy can also cause spider veins. Here the blood in your body is greatly increased. This causes the veins also to enlarge. Spider veins are typically found on ankles, thighs, calves, and legs. There are different natural ways to get rid of spider veins on legs. These natural remedies help in increasing the circulation of blood and clean the regions very effectively. Make sure that your circulatory system is working better, mostly in your leg region. Doing low intense activities like walking or doing household activities help in providing you better results. Leg toning exercises also can increase the blood circulation in your legs. Walk for about 30 minutes or more, at least 5 days a week. Try to get up and walk for 10 minutes every 2 to 3 hours. Raise your legs up on the balls of your feet and then lower your body back slowly for 10 15 minutes. This will help in making the calf muscles stronger. Try jogging, swimming, climbing stairs and other circulation-boosting activities daily. This also helps in getting rid of spider veins. When you are sleeping or resting, make sure that you elevate your legs. Change your positions or keep moving around. This way you can improve your circulation and thereby avoid spider veins. Losing weight is also great for preventing spider veins. This is because it helps in reducing the pressure on your legs. Massaging the affected area daily can improve the blood circulation and reduce the appearance of spider veins. You can use extra virgin olive oil or extra virgin coconut oil for this. They have antioxidant and anti-inflammatory properties. They also penetrate deeply into the skin. Take the oil in a small bowl and warm it. Massage the affected veins with this warm oil with firm but gentle strokes. Massage for about 10 minutes. You can massage this way 3 to 4 times a day. Using compression stockings is another way to increase blood circulation. It squeezes out your legs and provides you the comfort you need. It is important that you consult your doctor before you start using these stockings. Having a good and healthy diet is one of the great ways to prevent spider veins. Try to have diet that includes antioxidants and citrus fruits. This can do wonders for your body and improve the health of your veins as well. Garlic and ginger helps in breaking down fibrin, which is the reason for the appearance of hard lumpy area around your varicose veins. A simple home remedy for spider vein is to rub apple cider vinegar on the affected area. Keep it on the affected area for about 30 minutes. 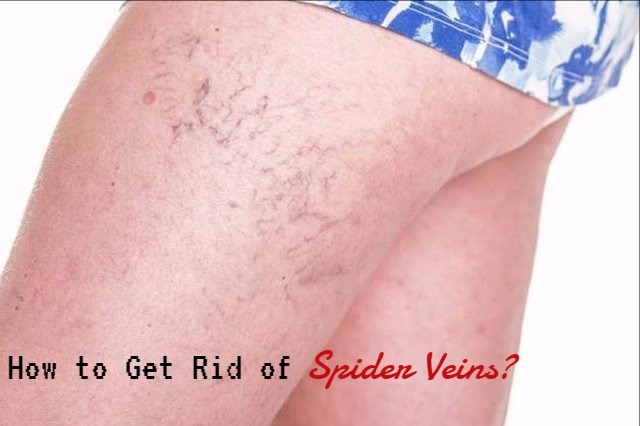 This can effectively reduce the formation of spider veins. These natural treatments for spider veins help in providing you relief that you need. With continuous practice you will find a tremendous change. Ginger can improve the blood circulation. So, it is great for treating spider veins. Ginger helps in breaking fibrin, which is a blood protein. It builds in the area where your veins are injured. Cut 1 inch of fresh ginger root into pieces. Add these pieces to about 2 cups of boiling water and simmer on low heat for 10 minutes. Strain it and then add honey. Drink the tea when it is still warm. You can have the ginger tea 2 or 3 times a day. If you are taking medication for blood thinning, then you should consult your doctor before you have this tea. Thank you so much for writing this post! My wife recently developed Varicose veins after giving birth to our two sons. She is currently very insecure seeing these veins. We tried the AVC methods but yielded no results! I am thinking of getting her some essential oil. But wanted to find out anyone has tried this method? I read an article on another blog saying Cyprus essential oil are the best. Anyone have any experience with them?